If a tree grows in a forest, does anyone hear? Probably not. But everyone gets to see, thanks to satellite imagery. We recently used satellite images to see whether regenerating trees and shrubs were causing remnant woodlands to ‘thicken up’ or get denser over time. The results give a great, big picture view of how entire ecosystems are slowly changing across the state of Victoria. Ecologists use the term ‘structure’ to describe how layers of vegetation are arranged in an ecosystem. How dense are the shrubs, are there many gaps between the trees, are the trees big and old, or small and young? Structural changes can have big impacts on natural ecosystems, as vegetation provides habitat for many organisms, and affects many processes, such as fire regimes, nutrient cycling and soil moisture levels. Many studies from different parts of Victoria have found that native woodlands and other ecosystems have thickened up over the last 50 years or so. In a great early study, Lauren Bennett found that Coast Tea-tree (Leptospermum laevigatum) had colonized over 1000 hectares of grassland and woodland since the 1940s at Yanakie Isthmus near Wilsons Promontory. Jodi Price and John Morgan recently reported that another native tea-tree, Manuka (Leptospermum scoparium), had spread across large areas of Victoria Valley in the Grampians, to form a dense shrubby understorey. Many years ago, I repeated an early study by Jennifer Withers and David Ashton, and found that Black She-oak (Allocasuarina littoralis) had increased from 911 to 3,565 trees per hectare between 1971 and 1996, to form extremely dense thickets at Ocean Grove. All of these areas were originally open, grassy woodlands, so the longer-term changes are quite dramatic. Many more studies from south-east Australia have shown similar trends. But how representative are these trends? Do they occur in most woodland patches, or have ecologists intentionally documented ‘extreme’ cases, that don’t show what’s actually happening in most areas? Most of these studies used old air photographs. This method is very accurate, but it’s slow to analyze the photographs manually, which is why most studies only cover small areas. Fortunately, satellite images are now readily available, which means that vegetation changes can be documented over large areas relatively easily. Satellite images not only cover the whole globe, but as time progresses, they are becoming more and more useful for documenting longer changes. The first Landsat satellite was launched in 1972, so Landsat images can now be used to investigate changes over the last 40 years. In a paper published in the Journal of Biogeography in 2010, we used a Landsat analysis, which was undertaken by the Australian National Greenhouse Office, to see whether thickening was widespread in woodlands and coastal areas across Victoria. The results confirmed the patterns found in many local studies, such as those described above. The four ecosystems we examined – Plains Woodlands, Herb-rich Woodlands, Riverine Woodlands and Coastal Vegetation – all thickened up over the past 16 years. We estimated that woody vegetation increased by 18,730 ha from 1989 to 2005, when we pooled the results across all areas. However, this number refers to the area of the pixels that contained woody vegetation, not the actual cover of trees and shrubs, so the number should be interpreted cautiously. In individual patches of vegetation, the changes were much more variable. The cover of trees and shrubs increased in many patches, declined in others, and stayed stable in others again. Most patches didn’t thicken as much as at Yanakie Isthmus, Victoria Valley or Ocean Grove. Nevertheless, the overall trend was for the cover of woody plants to increase over time in all four ecosystems. So, what do these changes mean for woodlands and coastal areas? The results highlight that natural ecosystems are constantly changing. Humans are good at seeing rapid changes – after fires and cyclones for example – but we aren’t good at seeing gradual, slow changes, even if these occur over large areas. Thanks to old air photographs and satellite images, we can now accurately describe long-term changes, which might otherwise have gone unnoticed. Unfortunately, we don’t know how thickening affects most plants and animals – which species are going to benefit, and which are going to be disadvantaged. Equally as important, we don’t know why many patches have thickened up in recent decades, although we can make some intelligent guesses. If the causes become more widespread in the future, then thickening may also become more widespread. If you find these questions fascinating, please consider joining the research team! We now know that thickening isn’t an isolated, rare occurrence in woodlands and coastal areas in Victoria. Instead it’s a widespread phenomenon. If a tree falls in a far-away forest, we may never get to hear. But thanks to satellite imagery, we can always get to see. Bennett, L.T. (1994). The expansion of Leptospermum laevigatum on the Yanakie Isthmus, Wilson’s Promontory, under changes in the burning and grazing regimes. Australian Journal of Botany 42, 555-564. Lunt, I.D. (1998). Allocasuarina (Casuarinaceae) invasion of an unburnt coastal woodland at Ocean Grove, Victoria: structural changes 1971-1996. Australian Journal of Botany 46, 649-656. Lunt, I.D., Winsemius, L.M., McDonald, S.P., Morgan, J.W. & Dehaan, R.L. (2010). How widespread is woody plant encroachment in temperate Australia? Changes in woody vegetation cover in lowland woodland and coastal ecosystems in Victoria from 1989 to 2005. Journal of Biogeography 37, 722-732. Price, J.N. & Morgan, J.W. (2009). Multi-decadal increases in shrub abundance in non-riverine red gum (Eucalyptus camaldulensis) woodlands occur during a period of complex land-use history. Australian Journal of Botany 57, 163-170. Withers, J.R. & Ashton, D.H. (1977). 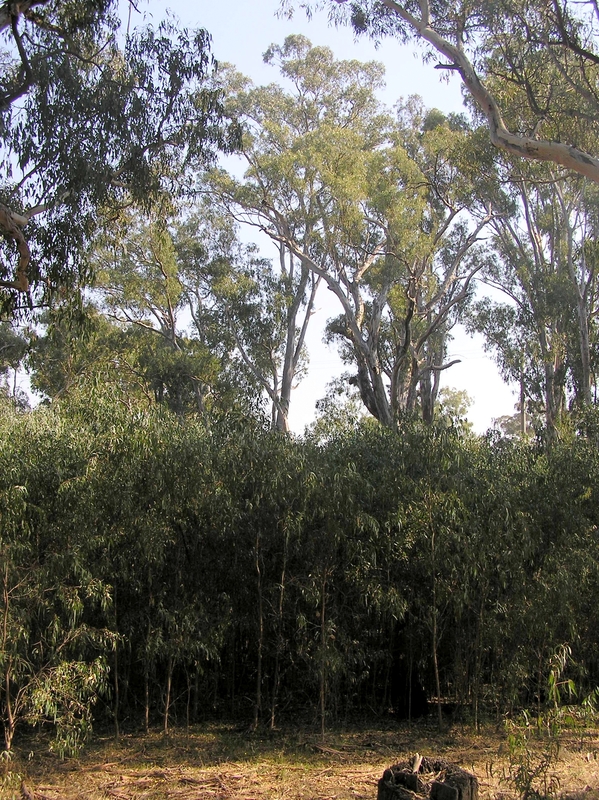 Studies on the status of unburnt Eucalyptus woodland at Ocean Grove, Victoria. I. The structure and regeneration. Australian Journal of Botany 25, 623-637. Previous Precious regeneration or woody weeds?